Most people know the route as the Road to Hana. But what about the return trip, what I call the Road From Hana? Sure, many people simply turn around at Hana and drive back as they came, and there’s nothing wrong with that. The views are magnificent as I described in yesterday’s blog. But there is another way to return from a visit to glorious Hana. Just keep driving clockwise, following the shore road. At first your journey is familiar, passing through deep foliage and waterfalls. But then the vistas open up as you pass farmland and eventually open terrain that give you unobstructed views of mighty, cloud shrouded Haleakala. Make no mistake about it, the road is rough, with a 5-mile stretch that is mostly gravel. The road immediately after Hana narrows to 1-1⁄2 lanes and if a car is coming from the opposite direction, one of you will have to pull over into a turnout to allow the other to get by. The road is twisty, too, but the views are utterly jaw-dropping. Perhaps the most iconic stops en route back to Kahului from Hana are at The Seven Sacred Pools and the Waimoku Falls hike. The Pools are located within Haleakala National Park, so there is a $10 admission fee. This place is well worth a stop and a photo hike. First, for the record, the Pools were so named in modern times by an engaging entrepreneur who felt that the real name, O’heo Gulch, was not exactly a turn-on to visitors. No matter, this place is a photographer’s paradise in the right weather. Unfortunately, on this visit the weather did not cooperate for me, so I can’t share an image. What you will see is a series of pools leading from the rugged ocean shore to a series of exceptionally picturesque cascading waterfalls. The view can bring tears, but you need to get there by mid-morning to avoid the crowds. You’ll want a medium tele and a longer tele to do this scene justice. If you want to shoot from the pools themselves, be very careful. You may want a moderate wide angle to take in both the foreground and the waterfall and bridge which tower above you. 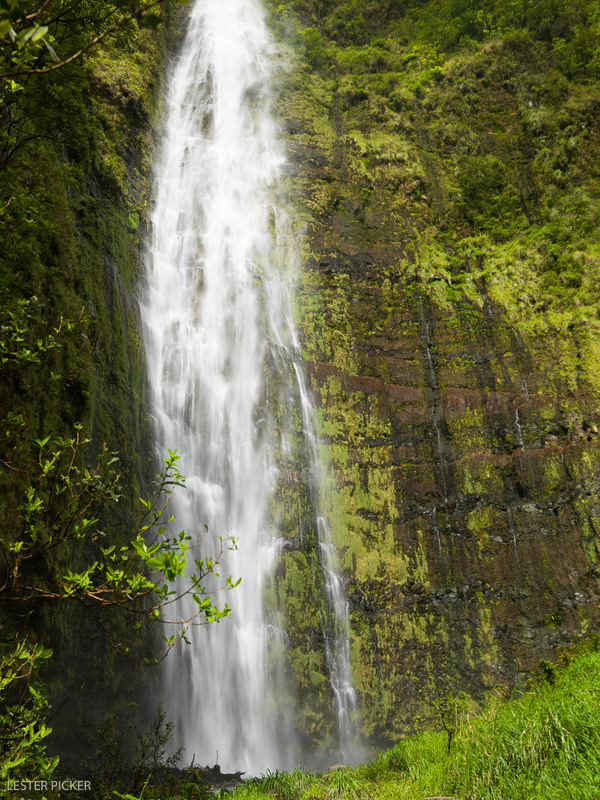 The hike to Waimoku Falls is one of the premier hikes on Maui (my favorite is the Haleakala Crater hike). I would categorize it as a strenuous hike for photographers, mainly because we carry so much gear. You will need a good backback to store gear because if the waterfall is running full you will have to ford two roaring streams. You cannot boulder hop them. You will get your feet wet, so hike in boots and bring along water shoes. Is it worth it? How does a 400-foot tall straight drop waterfall sound? A waterfall so voluminous it creates its own wind! On this 2-mile uphill hike you will also encounter a majestic banyan tree (.5 mile mark) that begs to be photographed. Then you enter a magical bamboo forest (1 mile mark) that demands reverential attention. Then you ford two streams and finally you have earned the right to capture Waimoku on film or card. Start early. We passed some jokers who started their hike when we were coming back at 4:30. This can actually be dangerous as the bamboo forest starts to get dark by then. Hiking down after 5:30 can be a serious mistake. Wear good shoes and bring water shoes with you. Plan to spend at least 4 hours if you are a photographer; perhaps 6 hours if you are a serious photographer. Carry a wide angle and a medium tele or macro-tele combo. You can leave the long lens in the hotel as you are almost in the waterfall when you finally get to it. Bring lunch and plenty of water with you. Celebrate every moment of this hike. 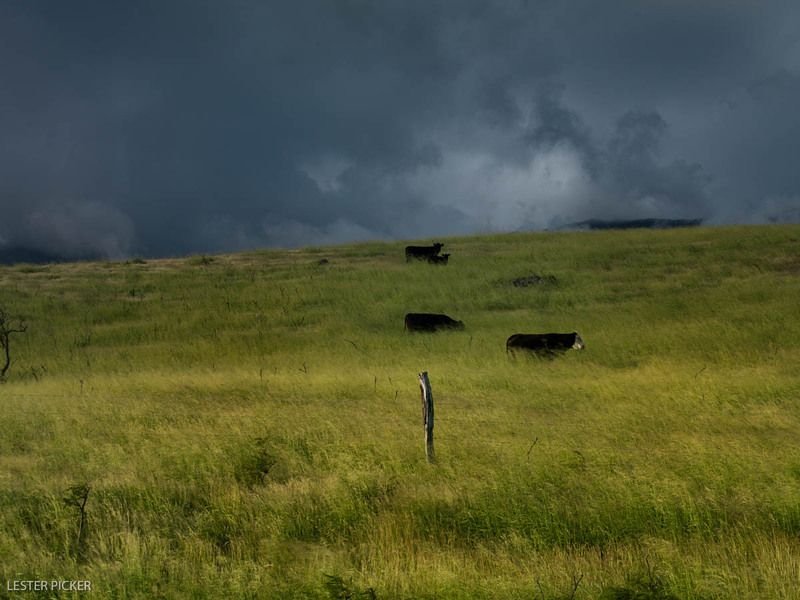 The final stretch along the Pi’ilani Highway offers radically different views of Maui, from fields of cattle to sweeping views of the coast on one side and Haleakala on the other. Enough eye candy to cause an extreme high! So, please don’t rush. Drive slowly, stop often, and exercise that trigger finger.